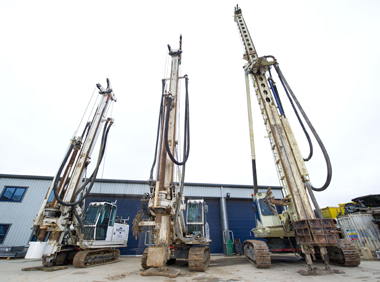 Burras owns and operates three piling rigs the Soilteck S100, Soiltech S60 and the Llamada P-90TT each with different features. We are currently developing a new rig that will allow us to install 450mm and 600mm diameter CFA piles to within 15mm of any obstruction such as boundary walls. We have developed a new piling rig that can now install 450mm and 600mm diameter CFA piles to within 15mm of any obstruction such as a boundary wall, to a depth of 14.5m (see Figure 3). Our current rig can install 450mm and 600mm diameter CFA piles within 15mm of any obstruction such as a boundary wall, to a depth of 14.5m minus the height of obstruction (see Figure 1). Or to a depth of 14.5m, 500mm from any obstructions (see Figure 2). The motor on the new rig will not overhang the boundary therefore does not affect party wall awards which is the most common difficulty we face on tight urban sites. CFA piling is normally the most cost effective solution; therefore this is a way of reducing basement costs and maximising footprint on these tight sites.